Back when I was learning to lead belay (and climb multipitch routes), one of my guides told my classmates and I that we needed to go get daisy chains and belay gloves before he’d let us lead belay: a daisy chain so that you can attach yourself to an anchor (although now I typically anchor with a clove hitch on the dynamic rope and have my daisy as backup) and gloves to make you more likely to catch a long fall when the force could otherwise start ripping the skin on your palms (yes, the thought of that makes me cringe, too). The belay gloves are especially relevant for someone like me, who has small hands and often belays someone heavier than myself and I’ve continued wearing them most of the time. I’ve found that they help me when I’m dealing with the extra friction when top-belaying with my Reverso, and they help keep my hands a little more rope-grime-free (because when my hands get all rope-grime-y, I’m even more likely to accidentally get rope grime all over my face). So over the past ~6 years I’ve gone through 2 pairs of Metolius Climbing Gloves, which are leather 3/4 finger belay gloves (I wear an XS). I’ve been pretty happy with them, except for the fact that sometimes the internal seams can really rub on the backs of my fingers (non-ideal when the cracks you’re climbing are doing that too). I recently received a pair of the new Black Diamond Stone Gloves, which are also leather 3/4 finger gloves (again, I wear an XS in these also). I’ve been using them for the past couple of weekends doing short multipitches and cragging and overall I’m very happy with them, although there are a couple small issues you may want to consider, depending on what you plan to use your gloves for. When I first put the gloves on, I noticed that they already felt nice. My previous gloves have always been a bit stiff at first (which makes the whole seam-rubbing-on-fingers problem worse), but these were good right away. 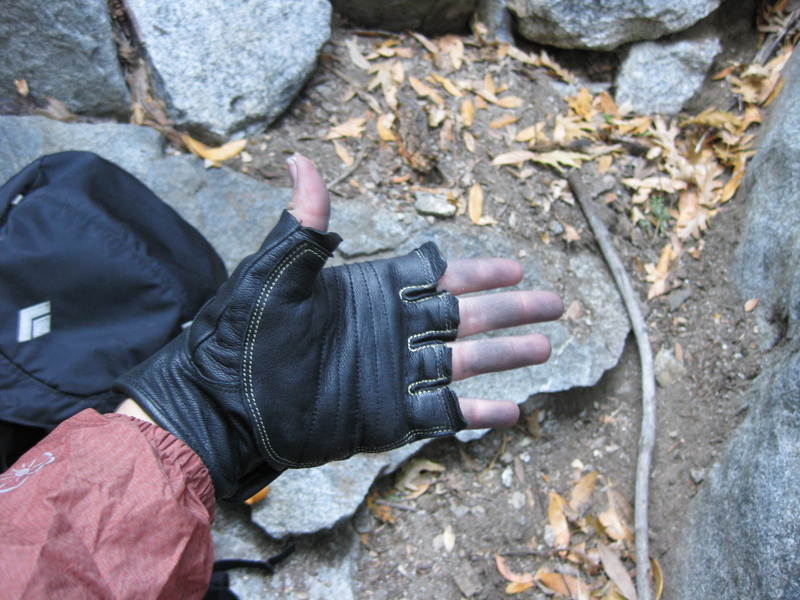 They fit me a little tighter than my Metolius gloves, but the Metolius ones were always a tad big anyways. I have the gloves in black, but they also come in tan. The black has been nice in this cooler weather, but for warm weather uses I imagine the tan might be preferable. The 3/4 finger length gave me good dexterity (a lot of full-finger gloves are too long for my small girly fingers), while still providing my hands with some warmth (which is another reason I like to have gloves with me). The gloves have a nice big (yet fairly low-profile) velcro strap to help with the on/off. They have worked just fine for standard belaying and rappelling and I don’t see any reason to switch back. The gloves are very well made and I think may be lighter than my previous gloves, which are both nice features. The fingers are not quite as long as the fingers on my Metolius gloves. This means you have to try a little harder to keep the rope in your palm and not rubbing against your fingers – so these may not be the ideal gloves for aid climbing, where you have a lot of rope-pulling to do. As you can see in the picture, there are holes in the straps. I assumed these were loops to clip in to when I want to put my gloves on my harness. So far they haven’t been as well suited to this purpose as the loops on my Metolius gloves. I also discovered some small loops on the inside of the glove that I guess you could thread a small loop of accessory cord through to make your own clip-in loops, but I still don’t know how well this would work. Basically the main annoyance is that the two gloves don’t sit in quite as low-profile a manner as I’m used to when they’re on my harness. Overall, I’d say these are great for most cragging and multipitch uses. 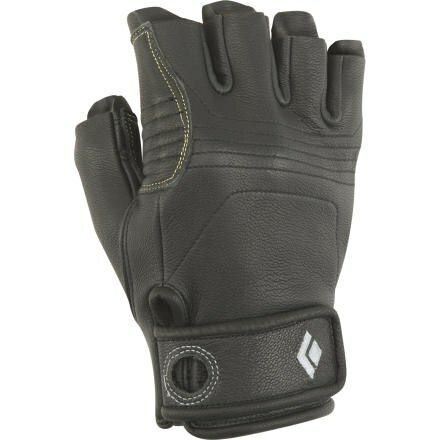 The gloves are well-constructed, reasonably lightweight, comfortable, and easy to get on/off. For any routes that could involve more hauling and aiding, I’d probably recommend going with something a little more heavy duty and with longer fingers. Any thoughts about other brands or styles of belay gloves? Full Disclosure: Black Diamond provided these gloves to DreamInVertical in exchange for this review. The opinions expressed above are my own and reflect my experience with these gloves. For more Sweet Gear reviews from Luke and Lizzy check out our Gear Reviews page. After testing out the Acrteryx R320 I was interested in trying out the competition. Right now I am testing the Black Diamond Chaos with the Kinetic Core Construction. So far I’ve mainly been cragging but it went up the Freeblast twice back in October. After a bunch more pitches I will be doing a full review with a comparison against the R320. I just bought a pair of La Sportiva Speedsters so I will be contributing to Lizzy’s review so we can get a dual perspective on this new soft soled slipper. 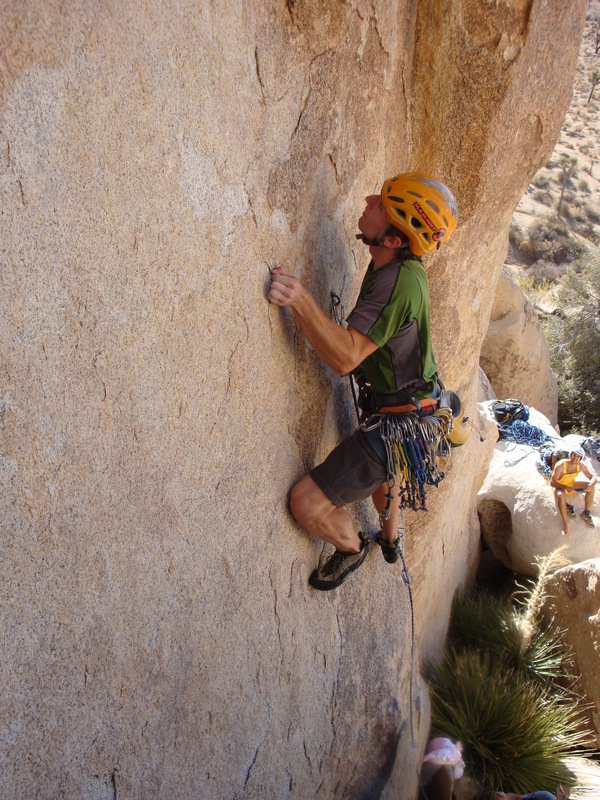 Expect this in the next two months after Lizzy and I have a chance to go bouldering on real rock. 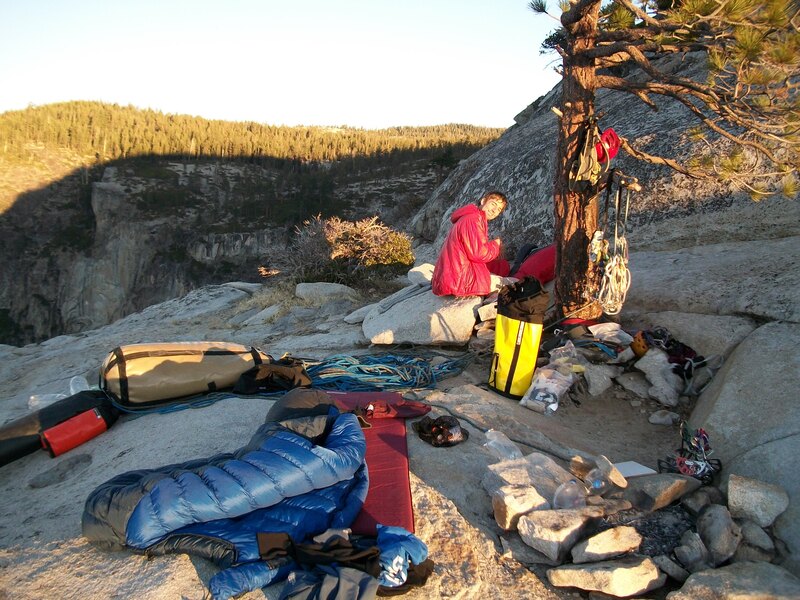 Lizzy and I have been climbing multipitches for a while and have found that in some situations hauling the pack can be ideal for the follower. After putting holes in many of our packs we have recently switched to using the Metolius Haul Packs when we want to haul. On the Original Route on Rainbow Wall I hauled a Zodiac pack, 15L, and on El Captain we used the Shield, 31 L, as a sub bag. These bags still look great after 10 and 22 pitches of hauling respectively. After a few more trips I plan on publishing a review and a few hauling tips. Also I think it would be nice to provided a summary of the summit/ follower packs that Lizzy and I have used. My current favorite is the Black Diamond RPM which is a bit on the large size (26L) but compacts easily and holds weight really well. 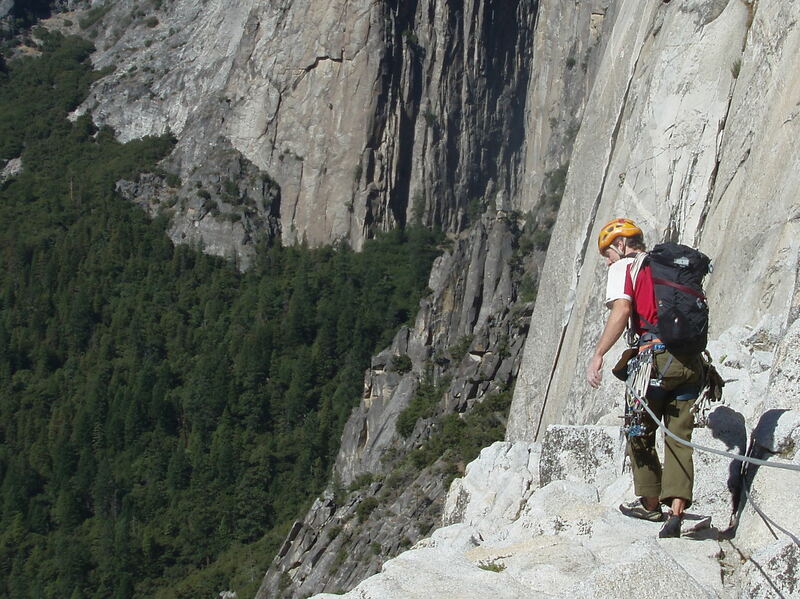 Walking across the Mammoth Terraces on El Captain with the Black Diamond RPM pack. After much searching and frustration with outdoor clothing companies, Lizzy has finally found a pair of non-cotton, non-yoga-style climbing pants that fit her in addition to providing sun and bug protection. After a few months of testing for durability Lizzy will be writing a review of the Columbia Womens’ Trekster pants. Also, Lizzy has been using the new Black Diamond Stone gloves and should have a review of them out shortly. I have a pair of the Black Diamond N-Force Ascenders and will be doing a comparison with the Petzl Ascension. After using the BD ascenders 4 days straight on Freerider I have a good idea about what I like and what doesn’t work. N-Force in hand, ready for El Captain! For other Sweet Gear reviews make sure to check out the Gear Reviews page. Its been little over a year now that Lizzy and I have been using our Reverso3’s, Black Diamond C3’s and Oz carabiners. I wanted to check back in and give some follow up comments to add to my first review . Looking back over the past year I’ve done over 300 pitches of climbing which is likely the reason my latest Reverso is looking pretty shabby. Lizzy’s is still going strong and she loves it. I have enjoyed mine and liked that it worked well with ropes of variable diameters and is very light weight for an auto-blocking belay device. One important thing that I have learned with the Reverso 3 is that the ease of pulling through the rope, in top belay mode, is proportional to the size of the biner that is being used. After getting my Arc’teryx harness I switched out my belay biners for the Black Diamond VaporLock which I usually use on my daisy chain. I like this keylock biner since it has a pretty narrow nose, good for clipping through bolts, and weights around 50 grams. However this biner does not work well with the Reverso3 when belaying a second on a 10 mm rope and I often had to add second biner. Some interesting stats can be found at Black Diamond on the use of auto-blocking belay devices. So when using the Reverso3 I suggest a nice round carabiner like the Petzl Attache or BD Rocklock. I just got the new Attache 3D which is a bit flatter than the Attache but has a bigger radius than the Vaporlock. I am currently using this biner for belaying since it is lighter than the original Attache and about the same as the Vaporlock. Overall, I really like the Reverso3 and only have a few minor complaints. The Reverso 3 doesn’t top belay as well with ropes fatter than 10 mm. This doesn’t effect me that much I usually use ropes between 9.4 and 9.8 but it is worth mentioning since I have had trouble with partners’ ropes. Secondly, my Reverso3 only lasted a year before the edges became fairly sharp (like previous models) and I no longer felt comfortable using it for belaying. As I said before this is probably reasonable since I used it for so many pitches, especially for rappelling, which causes the most wear. 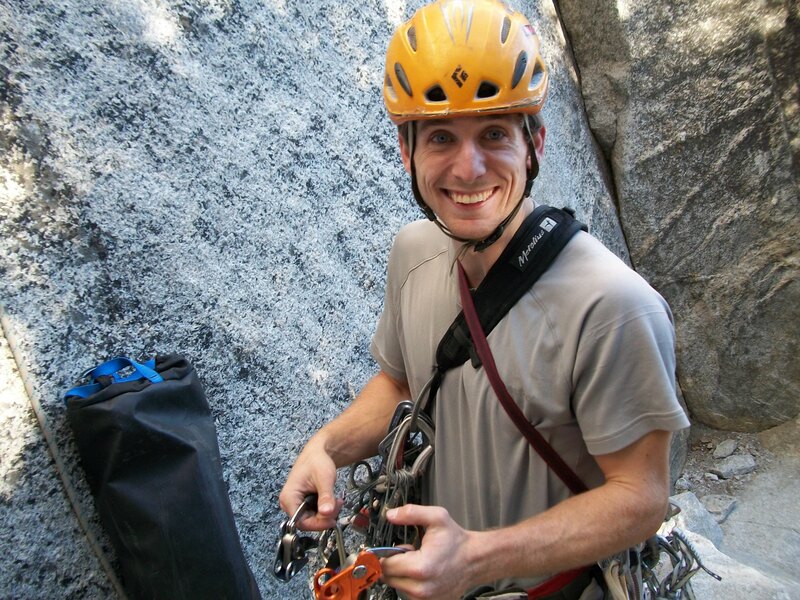 Black Diamond OZ Carabiners and Quickdraws. When I first got a hold of the Oz carabiners they went straight to my rack. It is easy to drop a pound or so off your rack by upgrading to these 28 gram carabiners. So far they have done well and have been taken up many pitches, clipped directly and scraped on sharp granite. I do see the shiny coating leaving some of these biners, but that’s to be expected and I see no scary wear from the last year of use. This year Metolius added another 23 gram carabiner to the market with the FS (Full Strength) mini. This carabiner is a bit smaller than the Camp Nano but has a nicer looking finish. Since this is even smaller biner than the Camp I think it would be pretty hard to clip in a time critical situation. I think the Camp Nano and the FS Mini have a place in the alpine realm where weight is essential. Also if you have small fingers or hands these might be a good option. I got to play with another two lightweight biners on our trip to Indian Creek back in March. One of our friends racks his cams on the Mammut Moses, which clock in at 27 grams. This carabiner is almost as large as the Oz but has a funny feeling since it is quite thin. For some reason this biner, as well as the Trango Superfly, 31 grams, just doesn’t feel right in my hand. A combination of a slick coating and the thin metal design makes me stay away from these biners. Many of my friends swear by the Superfly since it is cheap, almost full size and lightweight. I climbed with the Superfly and the Moses a bit more recently and got used to the shape which made me like them a bit more but not as much as the Oz. Also in Indian Creek, I picked up two DMM Phantom quickdraws. At 26 grams a biner these QDs are really light and weigh half as much as a Petzl Spirit draw. These got plenty of use and I liked them although they feel a bit small in my hand. I encountered a moment of truth with the Phantom when I just barely made a clip before pumping out at the anchors of Swedin-Ringle. Getting the clip proved these biners were workable and I was ready to get a few more. However, Lizzy dislikes the small size and that, coupled with the $25 per quickdraw price, kept me from buying a full set. After all this internal debate I bought a bunch of Oz biners on sale and a handful of 20cm BD dyneema dogbones to make long ultralight draws for trad climbing. I think a long quickdraw is faster than an alpine draw and often having 20cm is enough to alleviate rope drag. Unfortunately these draws were stolen at Smith Rock back in June. Luckily I found another sale and picked up a new set of 12 cm Ozs from Bouldering.com. These draws went up the Incredible Hulk three times and I am super happy with them. I recently bought a few more 20cm dogbones which I have used to extend my original DMM 11cm Phantom draws so that I have four long draws to go with my eight shorter OZ draws. The Oz quickdraws have gotten a lot of use and I am happy to have the variety added by having four longer DMM Phantom draws. I have gotten used to the lightweight feel of the Oz biners and can clip them with ease. Having quickdraws that only weigh around 60 grams each really helps reduce the weight on longer climbs. They also help you have a lighter pack for strenuous Sierra aproaches. The more I use the Black Diamond C3’s the more I like them. The initial dislike of the stiff springs has changed into a positive attribute. The added force of the springs gives me extra confidence when placing these small cams. As well the narrow head design really allows for the C3’s to be placed where no other cam would fit. As I said before I don’t like the largest size, the #2 yellow, since it seems to be more prone to walking. I’m sure there are situations where the head width would play in but for the most part I prefer the four lobe yellow Alien or the yellow TCU. I used a friend’s Red, #1 C3 on Positive Vibrations and Darkstar and found it to be a good alternative to the green alien even though I don’t own one yet. See the top tab for other Sweet Gear reviews or click here. Wow, its new and shiny, it must be amazing! I am a consumer, I must have it!! I try to keep thoughts like these at bay when I read through online reviews or the bi-annual OR gear show reports. Unfortunately I can’t help lusting after the latest and greatest in the outdoor industry. In my free time I read a lot of news and often hear about a product way before it comes to market. I remember 2+ years ago seeing an article about a capillary based fuel delivery system. This product, which sounded beyond cool, became the MSR Reactor. A similar story comes to mind about an ultra narrow camming device that would have longitudinal springs, a first in the industry. This information came from a BD rep and it was just a matter of time before the C3’s came to market. Lizzy was a bit skeptical about the super stiff triggers and I was thrown off by the $70 price tag. Could they really be that good? I could find TCU’s on sale for half the price. A year or so passed and I finally bought the three smallest sizes. Since buying these cams back in August they have been my preference for the smaller sizes. I did not buy the finger size ones since they did not seem to provide as much of an advantage. We have finger size aliens and TCU’s that work very well in that range. Also when I used a Yellow #2 C3 in Indian creek it seemed to walk more than the smaller sizes C3’s or a same size Alien. When the Reverso3 was released this year Lizzy and I were anxious to get our hands on one. The older style reverse wears dangerously (after a few years of use) and the new design was lighter and came in sweet colors. I feel that having an autoblocking belay device is pretty essential for mult-pitching. My Reverso3 got put through the paces with 17 pitches in the first two days of use. I learned quickly that the device was a bit picky with diameter. Trying to use the autoblock with a fuzzy 10.5 rope proved difficult. Lead belaying on the other hand work perfectly regardless of the diameter. So it should be noted that you want to have a sub 10mm rope if you expect to use the autoblock mode with ease. The Reverso3 really proved its worth when we were rapping cloud tower. The new friction slots allow for the Reverso3 to really grab thinner ropes. We were rapping with our lead line, a 9.5 mm Ion and the beal 8mm trail line and had no problem controlling our speed. The Reverso did a great job on the 8mm and we saw very little slippage a nice change for me from the previous generation. I was even able to do a single strand rap on the 8mm rope without having to redirect the rope to add friction. Also of note the Reverso still rappels well on larger diameter ropes. The last new toy that has become part of the rack is the Black Diamond OZ. This biner weights 28g or one ounce. It is the same basic shape as the Neutrino but with less metal. As a result the OZ is not as strong at 20Kn versus 24Kn for the Neutrino. The biner handles well and is noticeably lighter than the Neutrino. Our primary use for the OZ is a racking biner for our cams. They sit well and are ok to clip. This past weekend I doubled them up for use as alpine draws and they helped shave a considerable amout of weight. They are not the lightest on the market, bested by the Camp Nano at 23g, the Mammut Moses at 26g and the Dmm Phantom at 27g, but are still well below the average 40g biner. Overall I enjoy using these biners and time will tell in regards to their durability.